Lake Minnetonka Association: Sad News - Zebra Mussels in Our Lake - What Do We Need to Know and What should We Be Doing Now? Sad News - Zebra Mussels in Our Lake - What Do We Need to Know and What should We Be Doing Now? Everybody by now probably knows that zebra mussels have been found in Lake Minnetonka. I and everybody else who loves Lake Minnetonka hoped this day would never come. It is truly sad news for everyone. But, now that they are here, what next? As of now, it appears the infestation is limited to Grays and Wayzata Bay and the Lower Lake south to Big Island. All appearances are that we are very early in the infestation. Crews from the Minnesota Department of Natural Resources and the Minnehaha Creek Watershed District have and will continue to monitor the lake and more up-to-date information will be available in the weeks to come. The DNR will have a special page on their website dedicated to the Lake Minnetonka zebra mussel situation 9search ‘zebra mussel’). Also as of this time, the agencies are exploring whether any kind of containment may be possible. The Lake Minnetonka Association will work with the agencies to explore all options. Again, more information will be forthcoming in the next month or two. Typically, zebra mussel populations expand very slowly for the first two or three years, then multiply explosively. Given this assessment and the way zebra mussel populations typically expand, I would expect the full impacts may take two to four years to be realized. Zebra mussels will encrust hard surfaces – hard or firm lake bottoms, boat hulls, mooring buoys, inside mechanisms in boat motors, water toys, docks and lifts. Here are some precautions that should be taken. At the end of the day, unfortunately, zebra mussels will be in Lake Minnetonka forever. So, we must learn to cope with them. What should boaters and lakeshore owners do? 1. When swimming or wading, wear protective footwear to minimize cutting your feet, as zebra mussel shells are razor-sharp. 2. Remove irrigation intakes from the water and drain completely when not in use, as the immature forms will encrust the intakes and pipes. 3. If possible, keep your boat and motor completely out of water (when not in use) to minimize the encrustation of zebra mussels. 4. If it is not possible to store your boat out of water, contact a marina to inquire about protective paints and annual maintenance. 5. Run you boats long enough to reach operating temperatures. The immature zebra mussels are very sensitive to heat, so a hot engine will kill them as they are flushed through the cooling system. Drain all water reservoirs after each use. 6. Help prevent the spread to other lakes and rivers. If you take your boat out of Lake Minnetonka, thoroughly clean your boat and trailer inside and out and let it dry for at least five days. Scrape off any encrustations, wash with high pressure, hot water (120 degrees), then drain and dry all water reservoirs. 7. If you sell used docks, structures or water toys, be sure they are decontaminated and cleaned before they leave the area. We expect zebra mussels will affect the overall health of the lake and the fisheries. As the infestation develops, agencies charged with managing Lake Minnetonka’s environmental health – MN DNR and the Minnehaha Creek Watershed District - will be reporting to the community. I am saddened by this news, as I know all of you are as well. 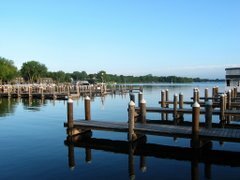 The Lake Minnetonka Association remains committed to being advocates for AIS prevention. While zebra mussels are here, there are dozens of other invasive plants, animals and pathogens coming toward of Lake Minnetonka. Genial post and this mail helped me alot in my college assignement. Thank you on your information.